Two Rubyspot species are commonly found in Arizona: the American (Hetaerina americana) and the Canyon (H. vulnerata) Rubyspots. The two species occupy largely similar habitats such as rocky and canyon streams (Paulson 2009). 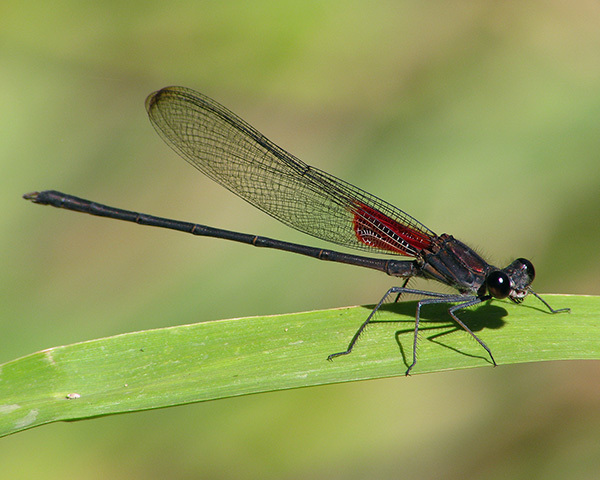 The American Rubyspot is found throughout the state whereas the Canyon Rubyspot has a more limited distribution and is usually found at altitudes exceeding 850 m (Richard Bailowitz, personal communication). On 24 October 2010 several male and female Canyon Rubyspots were observed in a patch of vegetation along the rocky stream of the Spur Cross Conservation area, Maricopa (altitude approx. 680 m), along with at least one American Rubyspot. This apparently represents the lowest altitude record of Canyon Rubyspot anywhere in the state (Richard Bailowitz, personal communication). It will be interesting to determine whether this population persists from one year to the next or this observation represents a one-time isolated event.